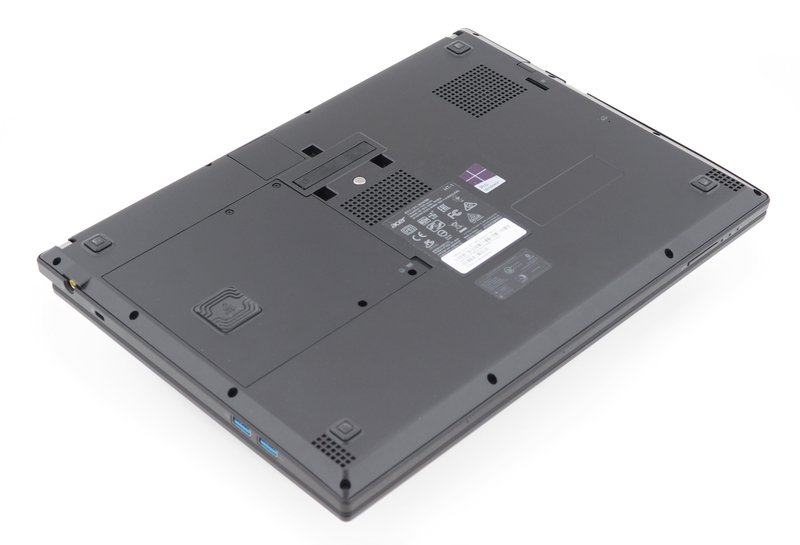 It’s been a while since we reviewed the 15-inch TravelMate P658 and now we will take a closer look at the 14-inch TravelMate P648. Will it hold up to the legacy of its 15-inch sibling, which we liked so much, or the 14-inch form factor has taken away some of the features? At first glance, the P648 doesn’t seem all that different from its bigger brother, aside from dimensions and weight, of course. 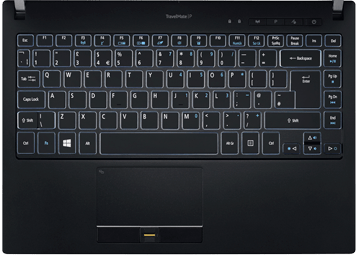 But given the price range of the laptop, we are pretty interested on how the laptop will stand against the already renown Lenovo ThinkPad T-series, more precisely the T470. Sporting an Intel Core i7-7500U CPU crammed inside a relatively portable chassis with plenty of connectors, upgradability options and a good IPS panel suitable not only for business work but for multimedia as well. But how about battery life, input devices, etc. – questions every business users tend to ask first when looking for such laptop. We find out in the full review below. 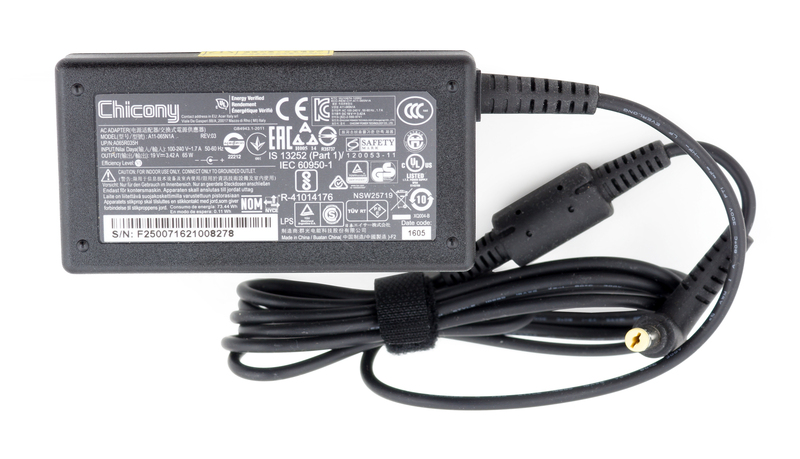 The package contains the standard AC adapter, power cord and the laptop itself. Similar to the bigger model, the TravelMate P648 sports a plastic finish with carbon fiber-reinforced base. The latter keeps the chassis pretty solid, sturdy and lightweight as possible. Weighing at just 1.7 kg and measuring around 21 mm in height, the 14-inch TravelMate offers impressively sturdy base and lid. First, let’s get the lid out of the way. 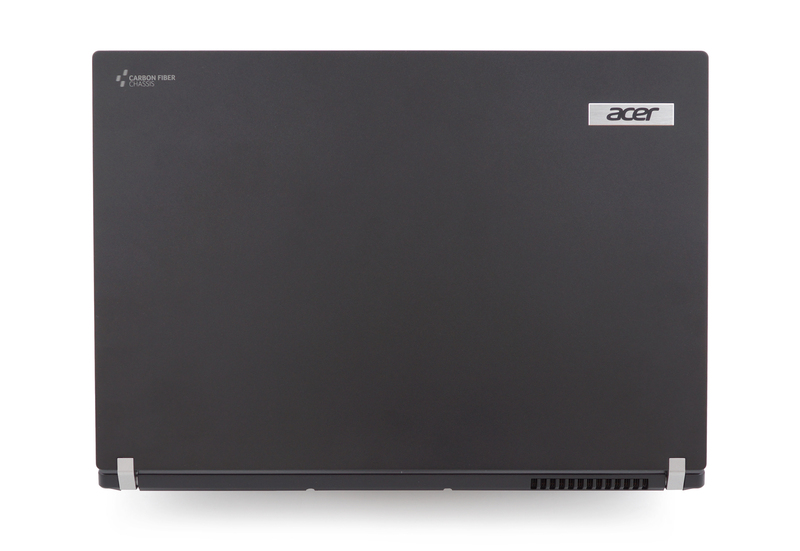 It has anodized-like finish with Acer’s logo in the upper right corner and a sign saying the chassis is made of carbon fiber so it lets customers know from afar. We definitely believe that as the lid appears to be extra rigid – doesn’t bend at all and it’s fairly resistant to torsion as well. On the other side of the lid, you will find the 14-inch matte screen with quite thin side bezels and normal-sized lower chin and upper bezel. They sport soft-touch matte black finish, which is a cool finishing touch in our eyes. The whole lid is supported by two small metal hinges that provide smooth and linear travel allowing opening the lid with just one hand and surprisingly, the lid isn’t bending in the center of the lower chin at all. 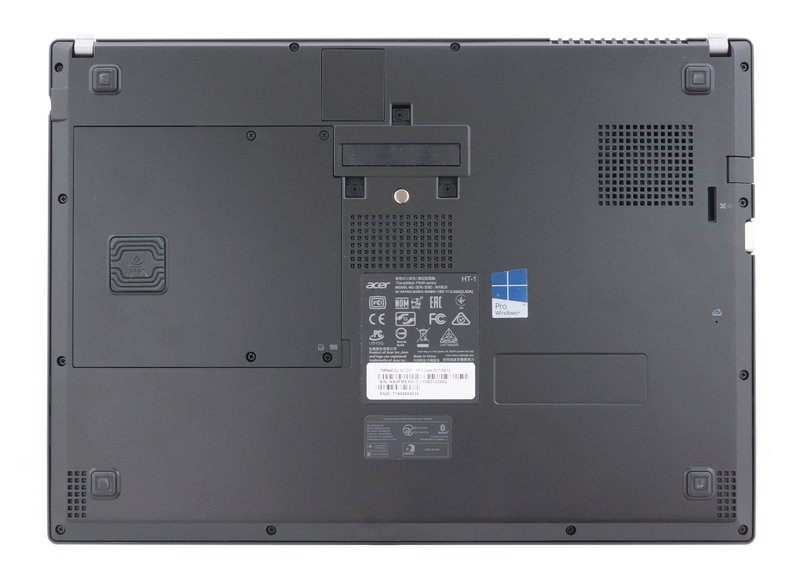 As for the bottom of the chassis, it uses the same material as the rest of the casing but also has some grills for extra airflow, a connector for the docking station and a dedicated service hatch providing easy access to some of the internals for upgrade. Although the sides aren’t exactly super thin in our book, they provide quite the I/O set – RJ-45 for LAN connectivity, VGA, HDMI, USB 3.0, USB-C 3.1 with Thunderbolt support and a 3.5 mm audio jack on the left. This leaves the right side with only two USB 3.0 connectors and the DC charging port. The SD card reader is placed at the front near the left edge and at the back, you will see the main grill for dispersing the heat. The interior continues to surprise with exceptional sturdiness not giving under our attempts to twist or bend the material. Virtually no visual deformation when pressed at the center of the keyboard or the palm rest. 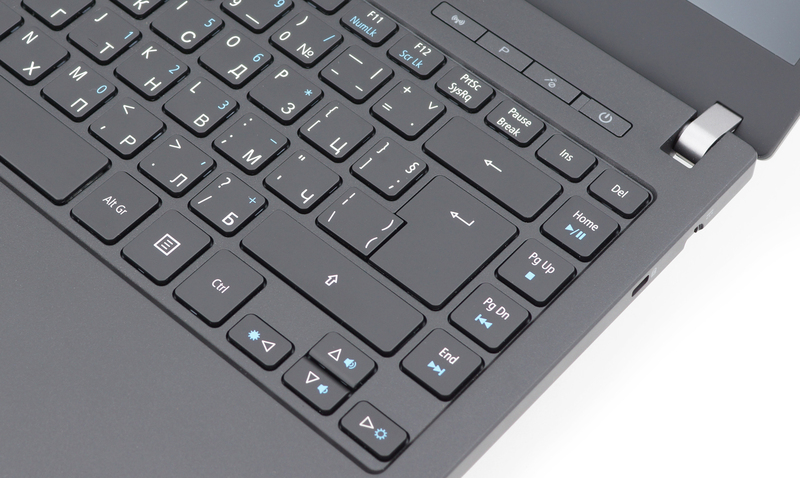 Speaking of the keyboard, it’s okay but definitely not the best we’ve seen from Acer. We didn’t like the fact that it’s shallow and we found ourselves questioning whether or not a certain key was pressed, although the clicky feedback of each key press helped to some extent. 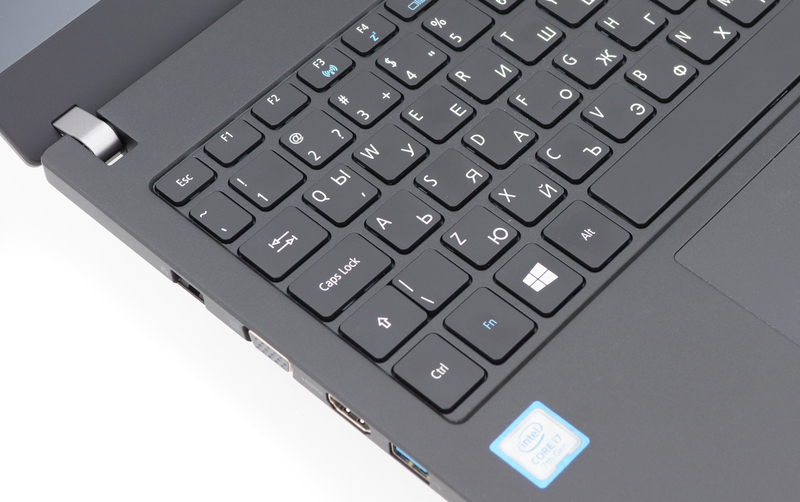 They’ve used the same keyboard on the 15-inch model, which we’ve criticized for the same issue. The touchpad, on the other hand, is excellent – good gliding surface, responsive, accurate and has comfortable mouse buttons. The fingerprint reader would have been better if it was somewhere else but you can definitely get used to it. 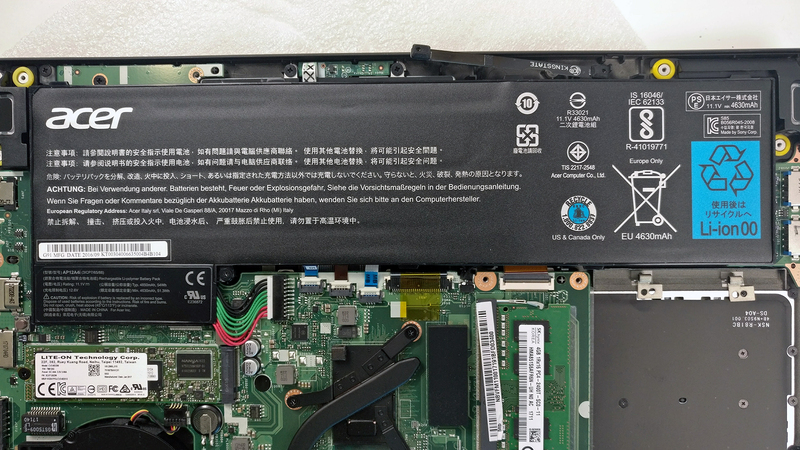 Most of the upgradable hardware can be accessed via the service lids but in order to change the battery, for example, a teardown is required. The storage and memory can be easily accessed. 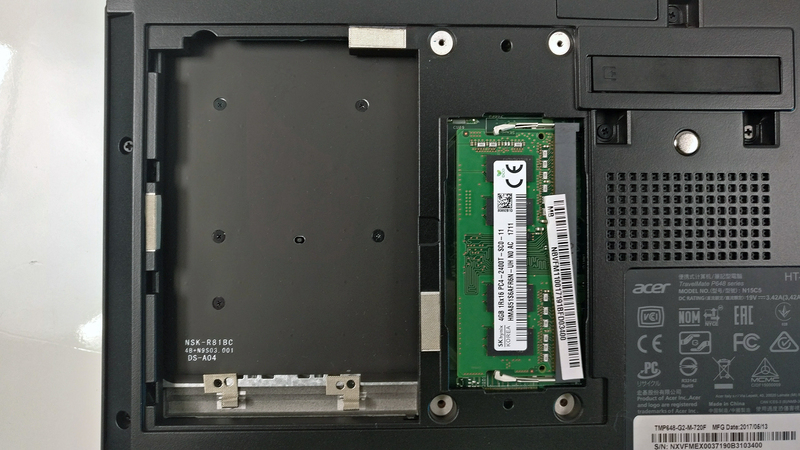 The 2.5-inch HDD, which in this case is missing, can be accessed via the service lid while the M.2 SSD slot is hidden under the hood. In our case, it’s Lite-On 256GB SATA SSD. Interestingly, the motherboard holds 4GB of DDR4-2400 soldered RAM chip and a slot for expansion. 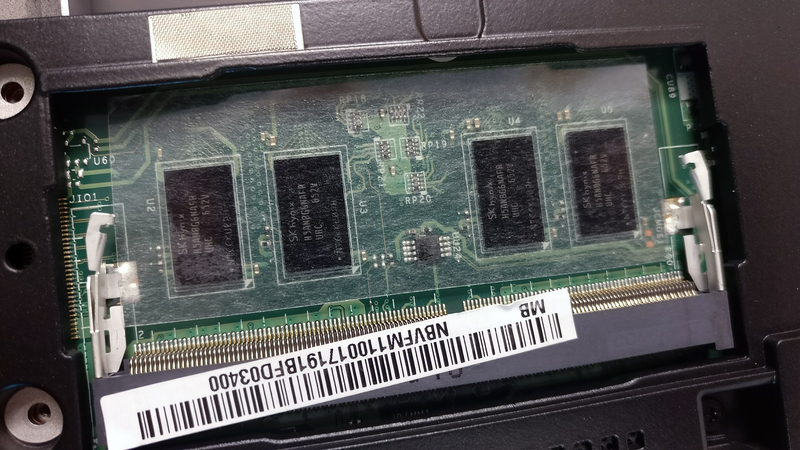 The reviewed unit feature 4GB of DDR4-2400 from SK Hynix making up for 8GB of memory. 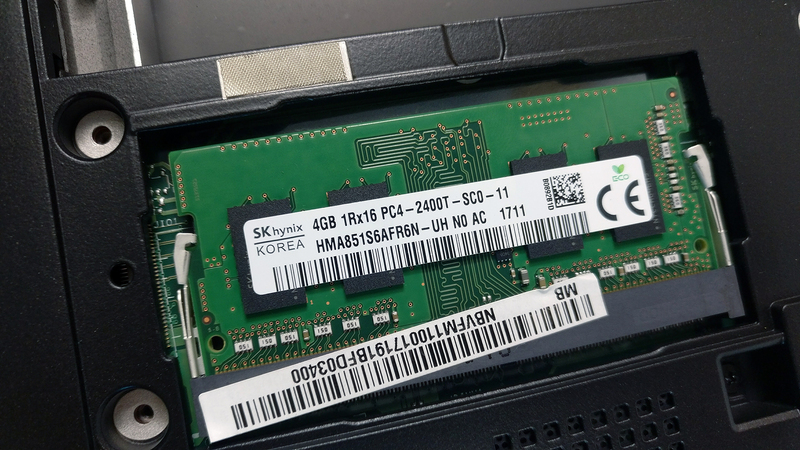 You can go up to 20GB (4GB soldered + 16GB additional). 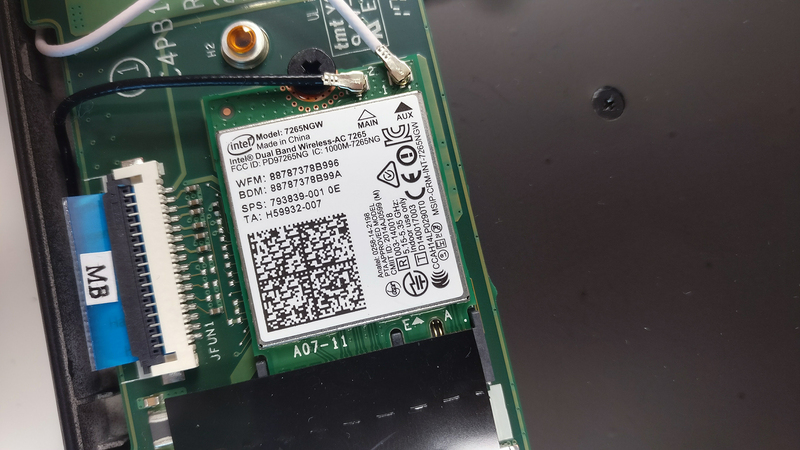 The Wi-Fi adapter is located right next to the 2.5-inch HDD/SSD slot and it’s Intel 7265NGW. The battery is rated at the respectable 54Wh. The notebook features a 14-inch Full HD (1920×1080) IPS display from AUO with model number B140HAN01.3. The pixel density is 157 ppi and the pixel pitch is 0.161 x 0.161 mm and can be considered as “Retina” from at least 56 cm. We’ve recorded a peak brightness 276 cd/m2 in the center of the screen and 270 cd/m2 as average across the surface with 11% maximum deviation. The correlated color temperature at maximum brightness is almost optimal – 6700K and goes up closer to the standard 6500K when going along the grayscale. You can see how these values change at 140 cd/m2 (47% brightness) in the image below. The maximum color deviation dE2000 compared to the center of the screen should be no more than 4.0 and if you are planning to do color-sensitive work, it should be lower than 2.0. But in this case, since the laptop is going to be used mostly for web browsing, multimedia and office work, a deviation of 3.0 is acceptable. 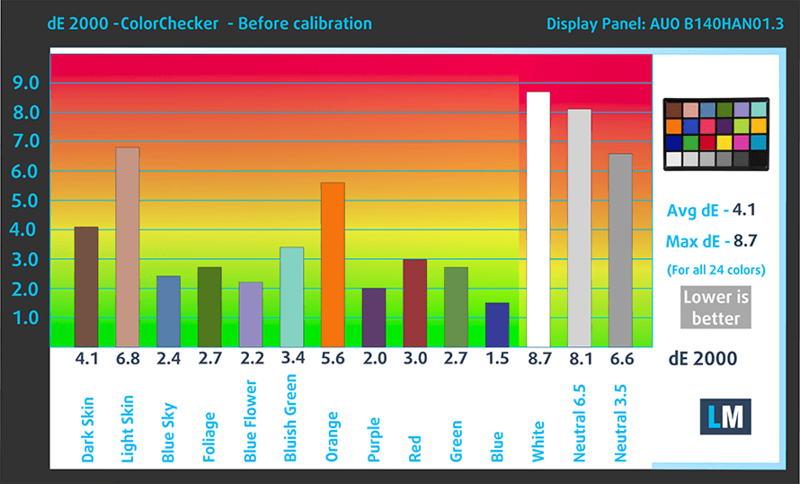 The contrast ratio is high – 1350:1 before calibration and 1160:1 after calibration. The display covers 95% of the sRGB color gamut, which is an excellent result. We recorded Fall Time + Rise Time = 20 ms.
Our equipment didn’t detect any pulsations throughout all brightness levels so it’s safe to use for long periods of time. Once again, the TravelMate comes with an excellent IPS panel suitable not only for general office work but for multimedia as well. It has wide sRGB coverage, high contrast, decent maximum brightness and doesn’t have PWM across all brightness levels. The loudspeakers appear to be a bit quiet and there are small deviations in the low and medium frequencies. 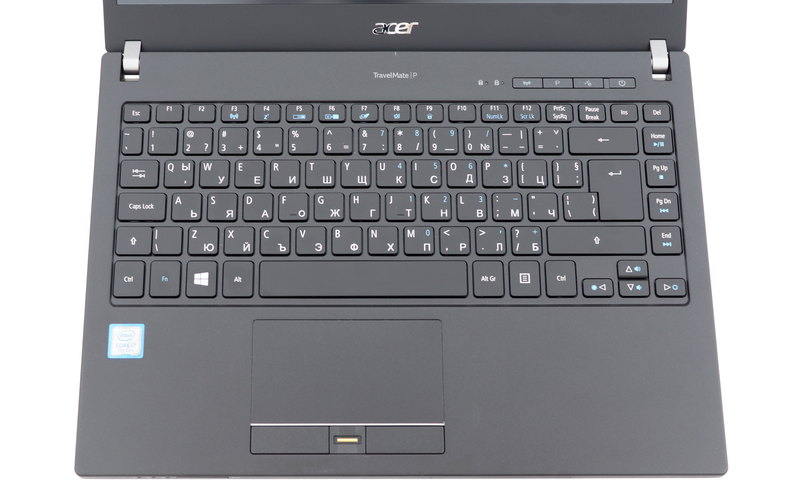 We used the pre-installed Windows 10 for the writing of this review but if you wish to perform a clean install of the OS, we suggest downloading all of the latest drivers from Acer’s official support page. 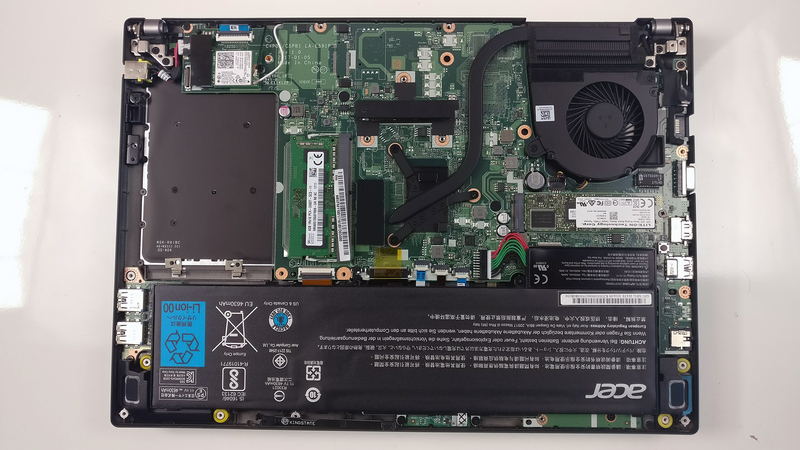 The system incorporates a relatively big battery (for a 14-inch machine) rated at 54Wh and unsurprisingly, the endurance ratings according to our tests are sky high. Beating its 15-inch sibling, the TravelMate P648 storms in with exceptional web browsing score and probably even more impressive video playback time. And even though, this isn’t enough to beat Dell’s Latitude 14 7480, it sure does leave the stock Lenovo ThinkPad T470 configuration far behind. The CPU and GPU stress tests aim to help us assess the overall stability and performance of the cooling system in the long run and not represent real-life usage. We test all of the devices we review. And as usual, we kicked things off with 100% CPU stress testing for about an hour. Interestingly, the CPU wasn’t able to sustain its maximum operating frequency for two active cores and ran a tad slower than it should be – 2.9 GHz. Temperatures were relatively high as well – 80-81 °C. Temperatures like these are usually intrinsic to quad-core chips in gaming laptops. However, after we turned on the GPU stress test, the CPU’s frequency didn’t drop at all. Temperatures were sustained and the iGPU was running flawlessly. We’ve also measured the surface temperatures – it appears that the center of the keyboard tends to get a little bit warm under load but this shouldn’t worry the general user as the cooling system is perfectly capable of handling everyday tasks and simple web browsing. 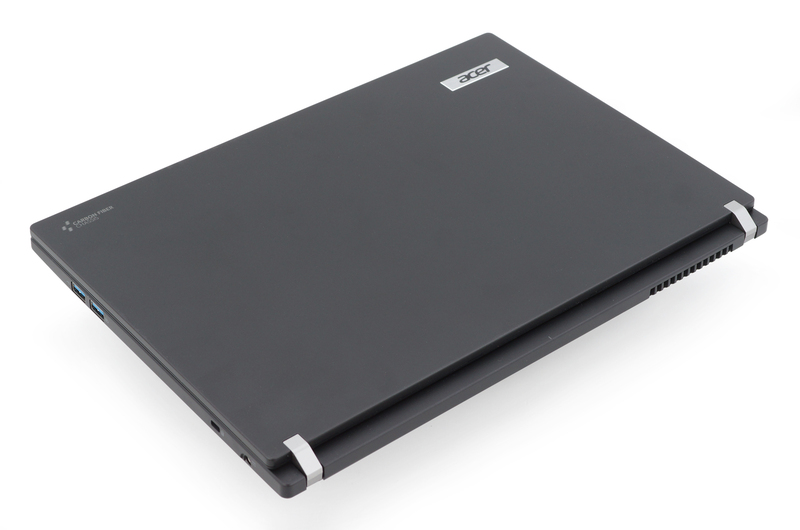 The good news is that the TravelMate P648 is no different from its 15-inch sibling and the rest of the TravelMate family. Unfortunately, though, with the pros, the TravelMate inherits the cons as well. 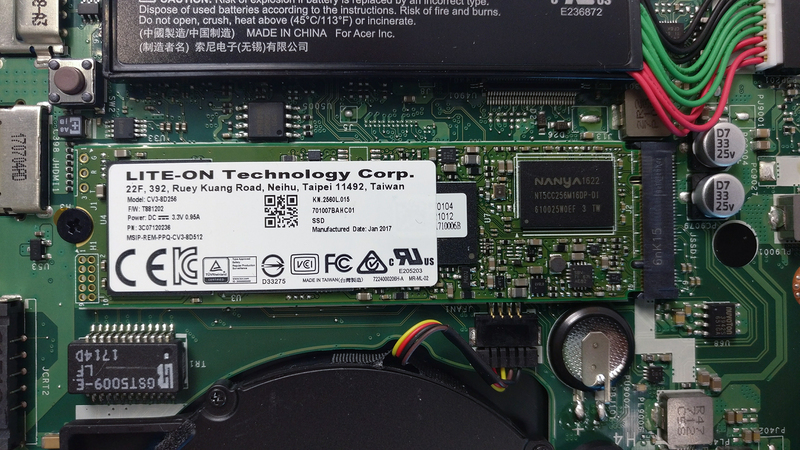 In this case, the rather shallow keyboard and the use of an M.2 SATA SSD in our configuration instead of PCIe NVMe drive. Given the price point, the latter would be more adequate. And with this, we ran out of issues to complain about. 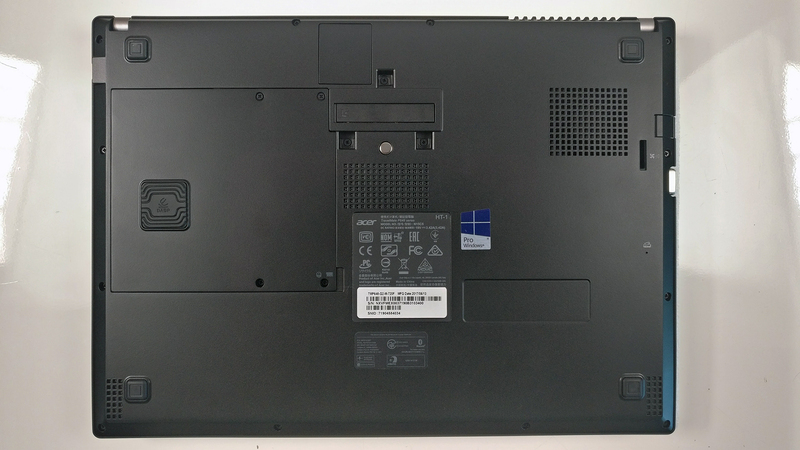 All the requirements for an upper-mid-range business notebook are met – sturdy and light chassis, good touchpad, long battery life, stable and silent operations, plenty of I/O (including USB-C Thunderbolt 3) and a good display. The latter is, in fact, suitable for multimedia as well due to its high contrast, wide sRGB coverage and decent maximum brightness. Moreover, PWM isn’t used for regulating luminance making it suitable for long hours of work. So is it worth your hard-earned money? Definitely yes! It even beats its direct rival the Lenovo ThinkPad T470 in a number of areas with the most prominent ones being screen quality and price.